GM plans a limited introduction of the plug-in Volt initially in Michigan, California, Texas, Washington D.C. and New York. It has been priced at $41,000 before federal and state tax incentives. DETROIT (Reuters) -- General Motors Co. and two Michigan utilities on Tuesday pledged to install more than 5,300 charging stations in Michigan as part of an effort to speed the adoption of plug-in hybrids like the upcoming Chevy Volt. The automaker also plans to have nearly 350 charging stations for employees at its Michigan facilities, as well as charging stations at about 1,500 Chevrolet dealers who will sell or service the Volt, GM said. GM Vice Chairman Tom Stephens said today that 600 dealers located in launch states will be equipped with charging stations. Another 900 Chevy dealers nationwide will become Volt service centers with charging units. As of Jan 1., GM had 3,463 Chevy franchises in the United States. The roll-out of charging stations for battery-powered and rechargeable vehicles like the Volt has been seen as a key step toward addressing barriers to their acceptance by a wide range of consumers. The Volt is expected to compete with the Nissan Leaf and Ford Motor Co.'s battery-powered Focus to be introduced in late 2011. GM said utilities DTE Energy and Consumers Energy will cover the costs for installing 2,500 home charging stations. The 240-volt home charging station for the Volt is priced at $490 and installation is estimated at $1,475. "For about $1.50 a charge, at these 240-v charging stations, the batteries can be fully charged in 4 hours. The cost is even lower in some states," said Micky Bly, GM's director of hybrid vehicle integration. "Many businesses will opt to provide free charging stations to bring in more customers. 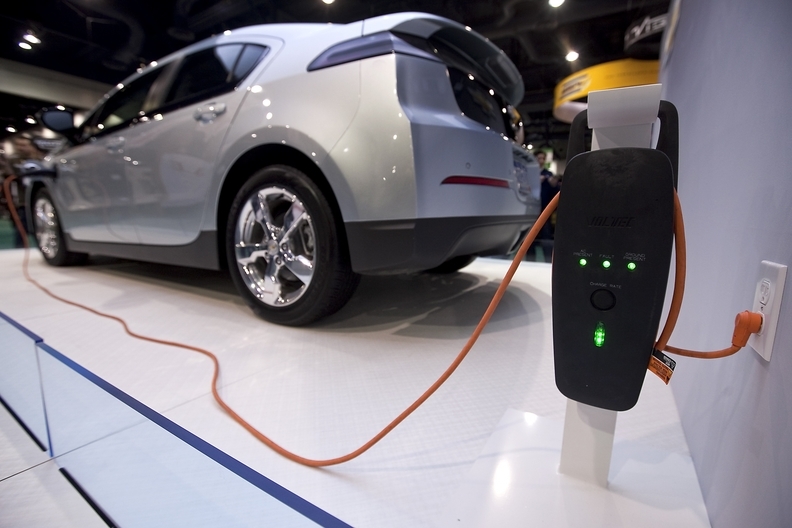 Hotels are contacting GM to provide the charging stations at their facilities." GM, which is expected to complete an IPO in November that would allow the U.S. government to begin to sell its nearly 61 percent stake in the automaker, will have 18 charging stations available at its headquarters in Detroit. Another 4,400 electric-car charging stations for consumers will be made available through a program funded by the U.S. Department of Energy.